Shopkeeper and ‘master tinker’ Laurie Melniczek loves art, science and imagination at Craftbox in Fenwick Island. The shop packs a punch with drop-in or take-home projects. Love art? Love science? Love hand-on projects, whether a kid or an adult? 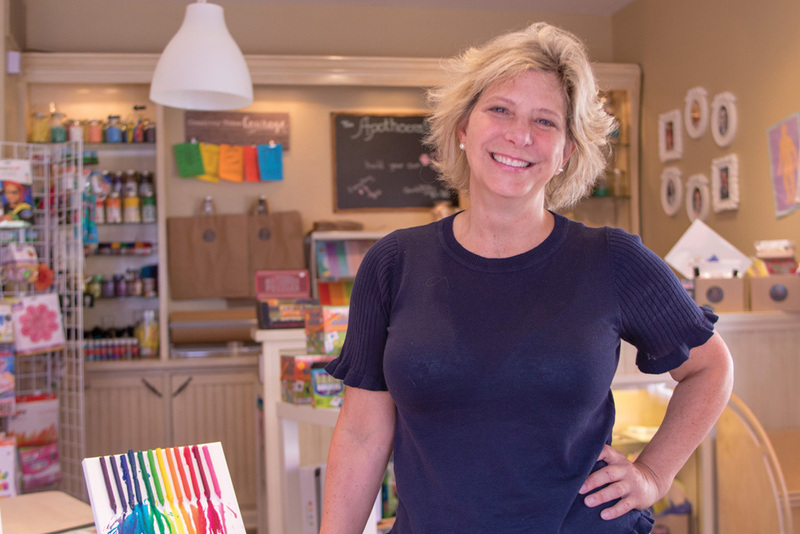 This summer, she opened the family-friendly shop — focused on science, technology, engineering, art and math (STEAM) — in Fenwick Island, tucked in the Village of Fenwick shopping center. 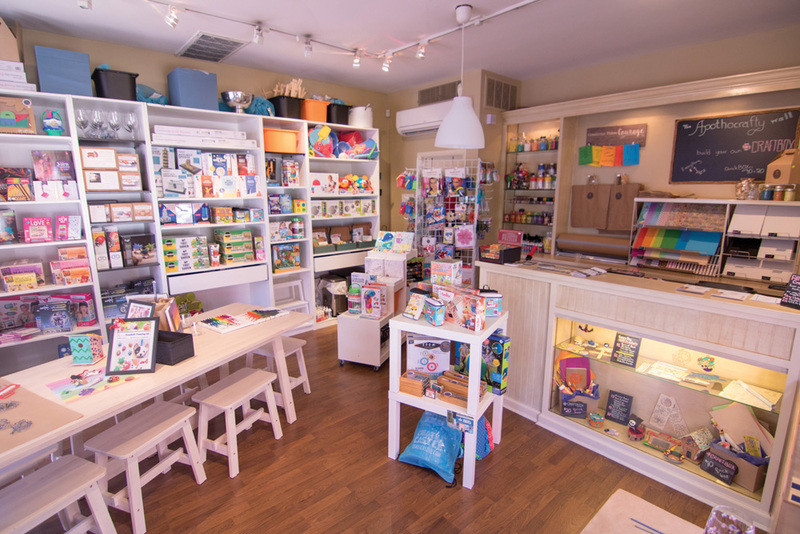 Craftbox, she said, has especially charmed teachers, homeschool families, grandparents with kids and others looking for that niche, shop-on-the-corner atmosphere. Customers can shop for science-project and art supplies, schedule a class or drop-in for a quick project to do right there. Sometimes people buy a pre-packaged activity but open it right there at the shop table, Melniczek noted. While on vacation, one family created their mother’s birthday present, right there in the shop. Another young man bought three tiny, identical puzzles for his friends to compete in solving. The activities are meant to engage the brain. “Everything in here is STEAM, so you can focus on science, technology, engineering, art or math. There’s very few things that are just mindless play,” she said. Some activities cross all age groups, such as the hand-painted wooden treasure boxes. She’s had 30-year-olds paint a delicate box decorated with gems and seashells as a birthday gift. She’s also had 3-year-olds smear some paint on a box as a quick craft, just to kill time. Everyone brings a unique view to their projects. Families can swing by anytime for a quick slime project on Serious Slime Wednesdays. Older kids can also come in the evenings for Teen Time. Tuesday night is “adult swim,” where people can paint wine glasses, and they will be treated to a complimentary glass of vino, as a guest of the store. Kids can also choose the in-depth, intensive classes. The Impressionism class starts with an art history lesson, ending with a 3-D hand-painted version of Claude Monet’s poppy fields. Slime class starts with the history of yeast in ancient Egyptian bread, leading to homemade slime concoctions. Soon, the shop will also host “Dinner at the Neighbor’s,” where kids make a project while parents grab a quick bite at one of four nearby eateries. For those with a unique vision of greatness, Craftbox also sells regular art supplies. Along the back-wall “Apothecrafty,” everything costs $1, whether a handful of colored pencils, chalk, fancy papers or small canvases, paint, glue, gemstones, beads, shells, pompoms, crayons, wax Wikki Stix, washi tape and more. Shoppers can take home a “Craftbox” with their choice of art supplies, or grab a pre-packed art or science box. “Some people will come in, and they’re like, ‘Oh, my gosh — this is just the best store ever!’” Melniczek said. Craftbox has activities for literally all ages. Kids can design birdhouses, weave friendship bracelets and build windmills with homemade bricks. Little ones can enjoy butterfly catching, painting suncatchers and even Kiwi Crate activities for infants. Adults will find master-level crafts and experiments with gardening, hot sauce, chocolates and cheese. Craftbox is the intersection of Melniczek’s life paths, starting with her business studies at NYU and the Wharton School. At an Indianapolis travel company, her work ranged from trip planner to tour guide. During tours to King Tut’s tomb, she’d make papyrus crafts with the kids. After “settling down” to have children, she went back to school to study physical therapy, expanding her love of STEM. Melniczek is also inspired by her two kids, now college-aged, who loved art and STEM. In summers, they learned about the world, choosing one country each week, starting with research at the library, then history, crafts and native cuisine. Weekly event schedules are posted on the business’ window and online. Craftbox is open regularly from 10 a.m. to 9 p.m., and closed Monday and Thursday. The shop can also host private parties. On rainy days, special pop-up classes will be announced on social media (www.facebook.com/CraftboxDE, and on Instagram and Twitter). Craftbox is located in the Village of Fenwick shopping center, 300 Coastal Highway, Shop 4, Fenwick Island. For more information, call (302) 539-7214 or visit www.craftboxinc.com.